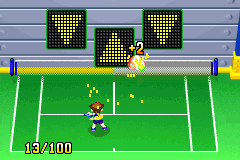 Wall Practice is a minigame in Mario Tennis: Power Tour for the Game Boy Advance. Unlike the other minigames (with the exception of Tennis Machine), Wall Practice is not beneficial to Clay or Ace's Power Shot. Instead, it helps their skill in other categories, such as volleying, topspin, and serving. The objective is to hit the tennis ball into the electronic wall panels in order to meet the score requirements for the level. With each level, the trickiness of the wall panels increases. Additionally, the player can consecutively hit the wall panels in order to gain extra points and beat the level faster. Completing the Master level will result in Kate and Harry walking onto the court to congratulate the player. Their dialogue will be different, depending on whether or not the player has won the Island Open or not. Beginner: Rack up points by hitting the ball toward the marks displayed on the wall panels. You need 30 points. Standard: Rack up points by hitting the ball toward the marks displayed on the wall panels. You need 60 points. Expert: Rack up points by hitting the ball toward the marks displayed on the wall panels. You need 100 points. Master: Rack up points by hitting the ball toward the marks displayed on the wall panels. You need 100 points. This page was last edited on April 18, 2019, at 14:56.